The Vestibule is a prime example of Norwegian Classicist architecture. The Upper Vestibule is where the Lord Chamberlain greets guests arriving for banquets and the recipients of honours before their audience with the King. 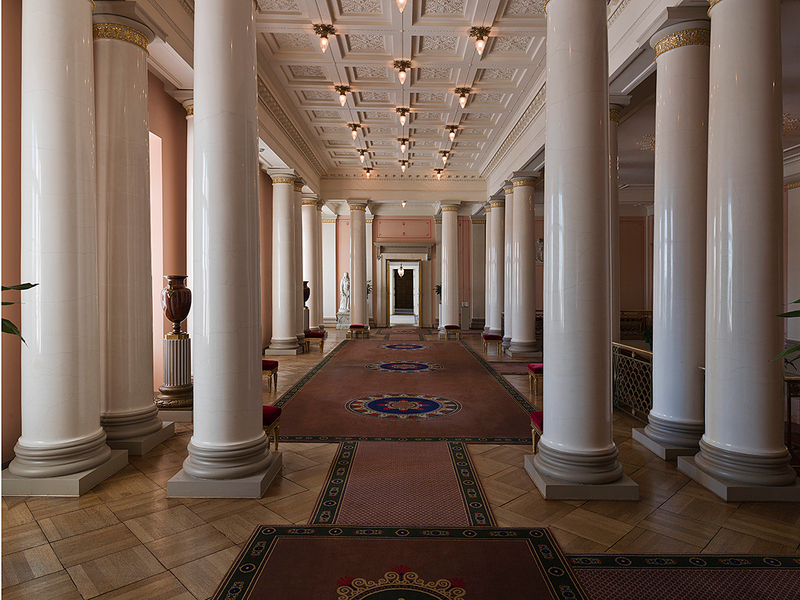 The placing of the Vestibule and the main staircase in the centre of the Palace determined the city planning of Oslo. The main thoroughfare, Karl Johans gate, was built in the 1830s to link the city centre with the kings residence. Karl Johans gate is one of Oslos principal axes and the only promenade of European dimensions in Norway. The main staircase brings the visitor via a landing to the Upper Vestibule, the piano nobile, where the reception rooms are located. One wall is occupied by the five tall windows behind the columns of the front façade, the central one being the door onto the Palace balcony. Thus after mounting the stairs the visitor is greeted with a view of Karl Johans gate leading towards the Parliament Building. The upper vestibule is rimmed with 20 columns in stucco marble. In the original plan they were to be carved out of white marble from Bergen, and the Storting allocated funds for this purpose in 1836. Quarrying was begun, but during one of his journeys abroad Linstow became convinced that stucco marble would be a better material since it permitted a greater choice of colours. He proposed stucco marble in 1839, and again in 1840 and 1842, when his idea was finally accepted by the Palace Building Committee. In accordance with Linstows original design, the walls of the Upper Vestibule are distempered in pale pink, with palmettes and panels outlined in vermilion, while the columns are a creamy white. The coffered ceiling has been distempered in white. The original staircase was replaced during the renovation in 1906-1907. Today the stairs and floor of the Vestibule are covered by specially designed carpets. Their ground colour reflects the deep brownish red of the staircase and banisters, and the patterns and motifs are based on Linstows detailed designs, with their classical ornamentation. Commissioned by King Oscar II and sculpted by Stephan Sinding in 1879. Commissioned by King Oscar II and sculpted by Mathias Skeibrok in 1882. The monument referred to is the bronze statue of Carl XIV Johan on the Palace Square. It was made by Brynjulf Bergslien and cast in Copenhagen. Oscar I was the first king to make use of the Royal Palace, and his bust has been placed in the niche above the landing. Dated 1882, it was made by Christen Daae Magelssen and purchased by King Oscar II. Sculpted in marble by Stephan Sinding and completed in Rome in 1882. The sculpture was part of the Norwegian peoples gift to King Oscar II and Queen Sophie on the occasion of their silver wedding anniversary in 1882. The sculpture was made by the Danish sculptor Jens Adolf Jerichau. It was given by Danish landowners to Princess Alexandra of Denmark on the occasion of her wedding to Albert Edward VII, then Prince of Wales, on 10 March 1863. It stood for many years in Marlborough House, London. This sculpture was also made by Jerichau, in 1868, and was purchased by Princess Alexandra in the same year. It had previously stood in Sandringham House, England, and was brought to Norway as part of an inheritance in 1925. The sculpture depicts the Bible story of Ruth gathering corn, and was completed by the Norwegian sculptor Carl Ludwig Jacobsen in 1885. It, too, was part of the peoples gift to King Oscar II and Queen Sophie on their silver wedding anniversary in 1882. The first phase: 1849-1906. The walls were distempered in pale pink and the panels picked out in vermilion. The pink background accentuated the creamy white of the columns. The second phase: 1907-1997. In accordance with the style of the time the walls in the Upper and the Lower Vestibule were painted the same creamy white as the stucco marble columns. During the most recent renovation of the Vestibule the question arose of whether to keep the 90-year-old colours, which were from the same period as the staircase and banisters, or to return to the original hues. In the end it was decided to repaint in the colours used in Linstows scheme, and in addition to gild the capitals of the columns, as Linstow originally proposed. The stairwell and passage of the Lower Vestibule, were repainted in their original colours in 1971, during the reign of King Olav V.
Stucco marble is a mixture of water, diluted bone glue, gypsum, crushed dolomite and pigment. The components are mixed manually and applied to a well moistened base. When the mass has hardened it has to be laboriously sanded down with pumice stone, preferably six to eight times, in order to achieve a high gloss. Since the vestibule columns are load-bearing, their centre consists of a wooden post covered with reed mats to which stucco has been applied.